(“Nothing to trade withal but mulberries.”—Sir George Somers). There is indeed no want at all. with words do seem to kill. There were more words to come. The Irish spy’s report gave a detailed account of Virginia’s geography, including the best way to get there by sea. 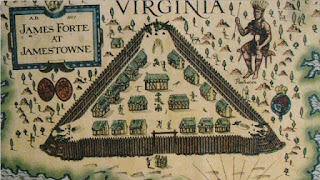 He described bays and rivers, Jamestown fort, and the land’s resources—but much of the account is sprinkled with falsehoods (there are pearls, coral, and perhaps diamonds in Virginia; the English plan to settle twenty or thirty thousand colonists there) and half-truths (Indians are devil-worshipers). Maguel warned that the English “want nothing more than they want to make themselves masters of the South Sea, so as to have their share of the riches of the Indies and be in the way of the traffic of the King of Spain, and to seek other new worlds for themselves.” Whether the mysterious Francisco Maguel, who hoped “to serve his Catholic Majesty” ever did so, is not known, but his report was enough to make Ambassador Velasco very nervous. It had a similar effect on King Philip III. In September 1610, two of Lord De La Warr’s ships, the Blessing and the Hercules, returned to England with unwelcome, disturbing news about Virginia. The Virginia Company’s Jamestown settlement was still full of sick and hungry colonists and, worse yet, there were no profits in sight. Investors looked in vain for their returns. The Spanish ambassador was not far wrong.